The IB704 PC/104 Plus module featuring the AMD Geode CS5536 companion device, optimized to work with the AMD Geode LX 800@0.9W processor. With a compact 90mm x 96mm footprint standard, the IB704 is suited for space-constraint applications in factory automation, military, security, transportation and POS. The board does not require a fan and features extended temperature operation that enables it to perform in harsh environment. The IB704 delivers the highest power/performance ratio available in the industry and comes with advanced graphics, connectivity and expansion features. On board is one SO-DIMM socket supporting up to 1GB of DDR SDRAM. 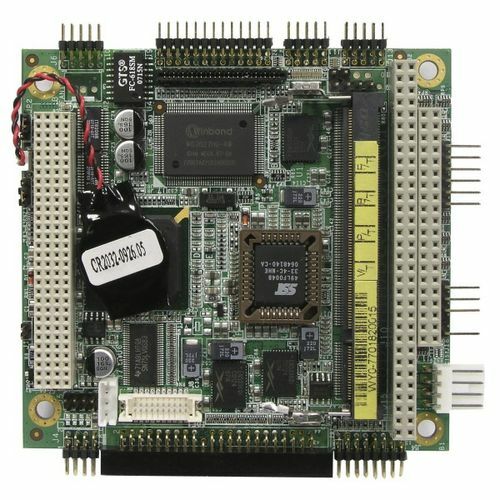 The integrated VGA controller supports for CRT, TFT and LVDS LCD displays. Connectivity interfaces include the PC/104+ connector and a 10/100 BaseT Ethernet, four USB 2.0 and two serial ports.